Yeah, but: It really only makes sense for phones. 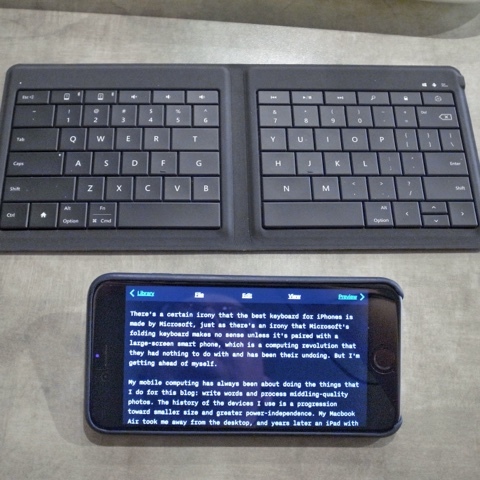 There's a certain perversity that the best keyboard for iPhones is made by Microsoft, but the counterpoint is that Microsoft's folding keyboard makes no sense unless it's paired with a large-screen smart phone – the computing revolution that has largely been their undoing. My mobile computing has always been about doing the kind of things that I do for this blog: write words and process middling-quality photos. 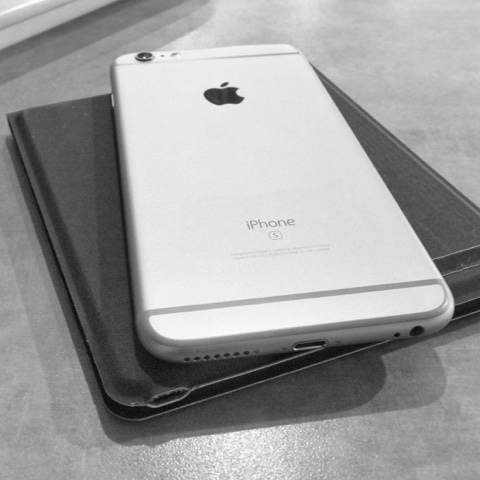 The history of the devices I use is a progression toward smaller size and greater power-independence. My Macbook Air took me away from the desktop, and years later an iPad with a Logitech keyboard case took over its on-the-road duties. I was able to travel across the continent with my full setup, including a couple of small cameras, in one tiny Mountain Co-op sling bag, and do most of the things that I could do at home. But now, thanks to my 5.5" iPhone and folding keyboard, I could do that same trip with just the electronics that I can tuck into my jacket pockets. There are some compromises, of course, but that's also true of carrying a traditional laptop, and traveling light is *awesome*. The Microsoft Universal Folding Keyboard is a compact keyboard that folds in half thanks to a split down the middle, similar to the Ergonomic design but without the funky angle. When folded it's small enough to carry easily in a jacket pocket, but the unfolded keyboard is big enough to have properly-sized but tightly-spaced keys. There has definitely been a typo-ridden learning curve, and I was surprised by how much my hunt-and-pecking was thrown off by the mid-keyboard gap and its "T" "G" "H" and "N" keys of unusual size. I'm also realizing just how often I cross that centre line, and am trying to improve my typing as a result. But I'm also used to the Apple keyboards with buffer space between the keys. Those with other keyboards – or those who can touch-type – may have a different experience with it. Functionally the keyboard is very good; Microsoft has always been good at its peripheral business. The throw is short, but no more so than for most laptops, and the feel is nice. It's also quite clever, turning on when it's opened and turning off when it's closed. The specs sheet says that it has a three-month battery life, but that must be anticipating heavy workweek use, since my iOS Batteries indicator still shows it at 91% after a couple of months. I may just charge it annually. While Ballmer may not think that the iPhone will amount to much, the "Universal" Folding Keyboard can be set for iOS/OSx as well as Android and PCs, so the home and function keys work properly for those devices. Yes, this means keyboard control over the home and lock buttons, as well as a replacement for iOS Music's missing transport and volume controls. Even better is the return of the usual keyboard-based cursor keys and copy/paste shortcuts. 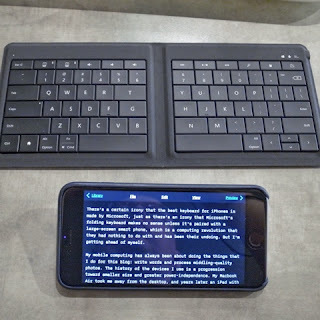 No, I wouldn't want to write a novel on my phone with this keyboard, but it's enough for a review. It's also quick enough and convenient enough for writing little social media blurbs, so that's really all I need from it. 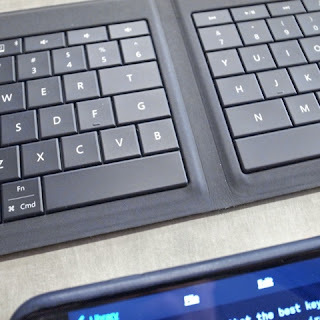 Other reviews seem divided on the folding keyboard, so I was initially hesitant in ordering it. And I suppose its modified layout could be a deal-breaker for some, but everyone I've shown ther keyboard to has liked it. Many have sworn they'll buy their own, just as soon as it goes on sale; Bill took the plunge and bought it sight unseen. I've even had a stranger in a restaurant stop me to ask what it was that I was typing on. So while not everyone has thought that it's worth the asking price, it is compelling.